On Sunday evening, members of Absolution Brewing Company’s MUG Club were invited to Absolution’s first bottle release; the Wanderin’ Star Bourbon Barrel-Aged Imperial Porter. Muggers were treated to pours of the newly released brew along with various snacks and sweets to snack on as they enjoyed their beers. The limited release Wanderin’ Star Bourbon Barrel-Aged Imperial Porter comes in individually numbered 750ml champagne bottles and are available at the Absolution tasting room for $18.00 each. 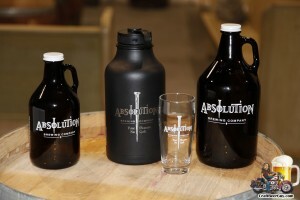 They also have gift packages that include Absolution Brewing Company glassware for $30.00 at the tasting room. You can reserve yours by emailing nigel@absolutionbrewingcompany.com. This would make a nice Christmas gift for the beer geek in your family. On Sunday evening, Torrance’s newest production brewery, Absolution Brewing Company held a private party at their tasting room for members of their loyalty program, The MUG Club, Founders Division. The MUG Club was limited to just 125 people the first year and sold out so quickly that they decided to open it up again for American Craft Beer Week, and named it the ‘R U Feelin’ Wicked’ division. I joined the initial Founders division of the MUG Club and I have spoken with several other MUG Club members and I have yet to meet anyone that regretted their decision. The merchandise received, including t-shirts and a custom growler, combined with discounts and special events makes this a steal. The Founders Have Fun event Sunday night was a great example of the value received. MUG Club Founders and their guests were treated to free beer, finger foods and live music provided by one of the South Bay’s fun rock bands, Barley Legal. I have several friends that always spoke highly of Barley Legal but this was the first time I heard them play; I have to say, they put on a great show. It only took a couple songs before attendees were dancing in the tasting room and even a couple got an opportunity to sing with them. Barley Legal is one of those acts that definitely gets their audience into the groove with them. If you have an opportunity to see them perform, take it; you will not be disappointed. Friday evening, Torrance’s newest production craft brewery, Absolution Brewing Company, held a private launch party for members of their ABC MUG Club. The MUG Club is an exclusive membership for fans of Absolution Brewing Company that has many perks, one of which was being invited to last night’s launch party. They had a very nice turnout with about 75-100 people showing up. MUG Club members received Absolution Brewing Company t-shirts, caps and custom stainless steel growlers; and beer, lots of good beer. The craft beers offered included their Tribulation Cream Ale with both the house yeast and an experimental; Sinner Stout, Wanderin’ Possessed Porter; Cardinal Sin Red Ale, again with both the house yeast and an experimental; and Angel’s Demise IPA with both the house yeast and an experimental yeast. In addition to the beers there was Forbidden Cider, Sweet Reformation Dry Strawberry Mead as well as their Redeemer Root Beer and Confession Cream Soda. For a launch party they really had a lot to offer and I think it is pretty obvious that Absolution Brewing Company is going to be a great addition to the South Bay craft beer scene. If you will recall, two weeks ago I announced that Torrance is getting another craft brewery, Absolution Brewing Company (ABC). Now, just in time for Christmas, Absolution Brewing Company has announced their ABC MUG Club. The ABC MUG Club is an exclusive membership for fans of Absolution Brewing Company and if you are looking for a one-of-a-kind Christmas present to give the craft beer aficionado in your family, this might be exactly what you are looking for. Membership is limited to just 125 people the first year, so it is definitely exclusive. As a member of the ABC MUG Club you will be invited to the ABC exclusive soft opening at the brewery/tasting room and get to experience all of Absolution’s new beers before they are released to the general public. In addition, you will also be invited to their exclusive MUG events and cask nights. As if this was not enough, in addition to the above you will receive an Absolution Brewing t-shirt, cap and a custom 64 ounce growler with a free first fill! I hate to sound like the ShamWow guy, but that’s not all. You will also receive $1 off every full pour at the tasting room as well as $1 off every subsequent growler fill and you will receive 20% off any additional ABC gear. You get all of this for a guilt free $125 plus tax, the shipping is free. Heck, this is a great Christmas gift to give yourself. Remember, there are only 125 openings this first year and some of those openings are already taken; yes, I got one of them. You can read all the details, including the fine print on the Absolution Brewing website or call them at (310) 490-4860. You know you are going to end up buying a growler anyway, so you might as well get it now and get one of the custom growlers. They are pretty cool and I cannot wait to get mine filled. Those of you that have been following along on Facebook know that I have been following the progress as the ABC team readies their tasting room and as I watch their attention to detail in the construction phase of the brewery and tasting room, I am really looking forward to trying their brews. Cheers!